Welcome to new attendee Ofer. For the last card, Gili calculated everyone’s score in order to determine if it was safe to simply take the card (it was). 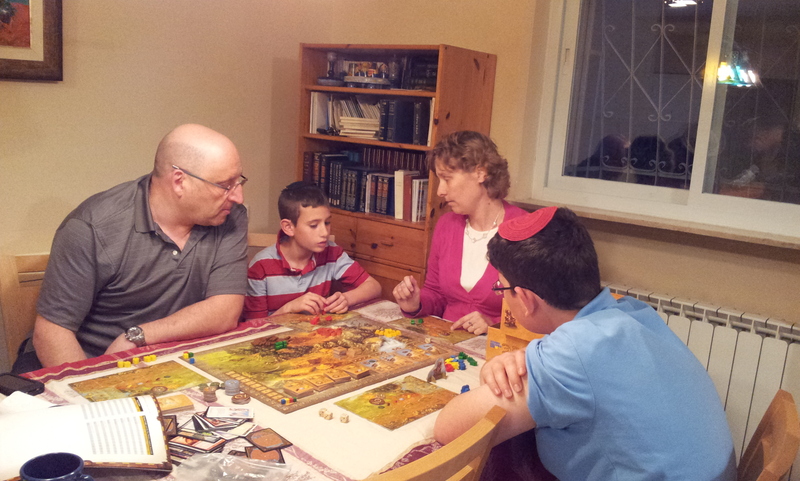 First play for Elad and Ofer, first play in a long while for Nadine. Again, the play was pretty aggressive, although we had no soldiers in the new world until turn 6 or so, but then we had 4 warfares every turn (for three turns), most by Ofer. This game is designed a little unbalanced toward money and buildings, in my opinion. Admittedly the design would work better if warfare and combat were easier and more worthwhile. It should be easier to get soldiers into the new world. Whomever controls a region should have an additional resource of the region’s type. Warfare should be a bit more flexible and less costly. Anyhoo. 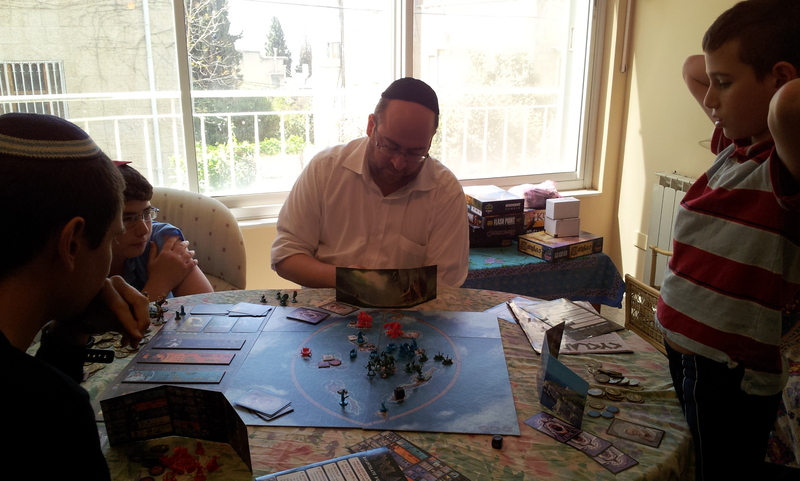 Elad cornered the early commodities and then managed to win 7 out of 8 merchant ships. After his third one, it was no longer any use fighting for them. I think he had a merchant and captain every round. He had the highest income, and had no problem getting the “4 points for every merchant ship” building, but he had almost no points from the new world. Gili sacrificed herself to take the “steal money from each player equal to your merchant ships” building before Elad could, even though she had no merchant ships. I had one, and would have been willing to take it myself for the modest gain it would have given me, but she decided to keep it away from both of us. Meanwhile, I was doing okay in the new world, but so were others. I was slightly outclassed in the new world, and Elad slightly outclassed me in building and income points, but since I had both new world ad buildings – and no one else did – I ended up ahead. It was hard to see that until the end. However, Gili apparently saw it, because she attacked every first place region I had on the board. I still came in second in many regions. Everyone except for Gili failed their last discovery by a single native. The game took about 3.5 hours, including explanation. I achieved a rare win over David, but it was close. 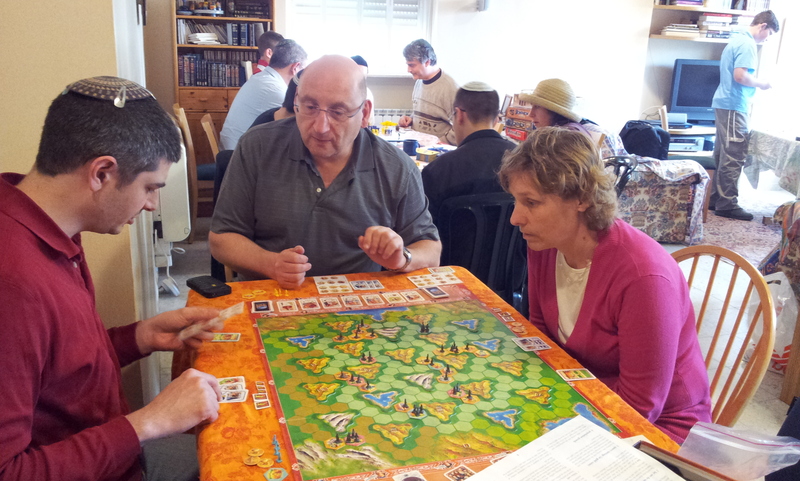 I played WRu, and David played BGu (I think). 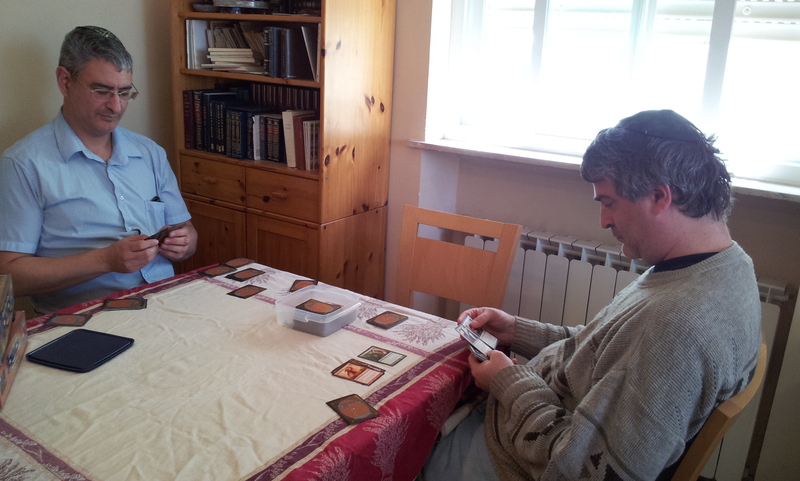 We both drafted a lot of fliers; David also had walls and I had a few large ground creatures. But I also had more direct damage and white instant boosters. We both started a little mana shy, but no color problems. I took David down to 8 and then to 5, and was set to kill him but he jumped back up to 10. Then he got a few flying damage in, and threw 4 +1/+1 counters on his flier, but I boosted my flying defense with an instant and killed his. I eked out the last few points with two direct damage spells. Second play for Nadine and me, first play for the others. 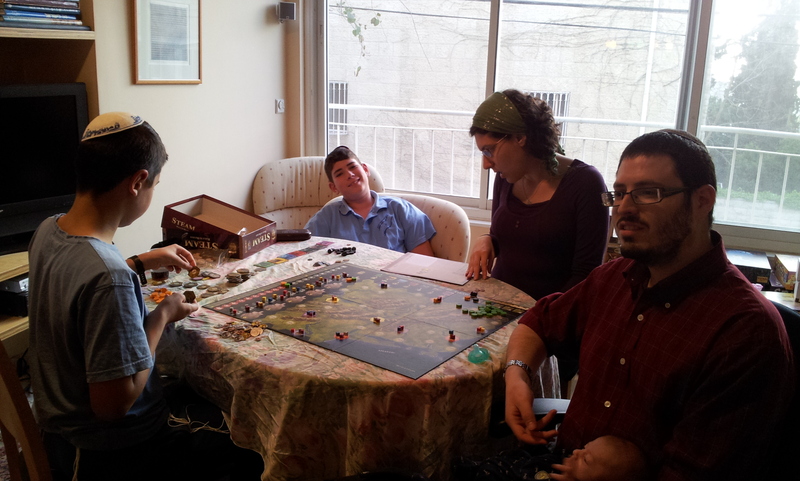 Nadine thinks the game is ok. David I think also thought it was ok. Aaron liked it, and Nisan didn’t like it. I like this version of the game, but I think the shorter version (Take It Easy) played on a curtailed board is probably a better filler experience for most people. 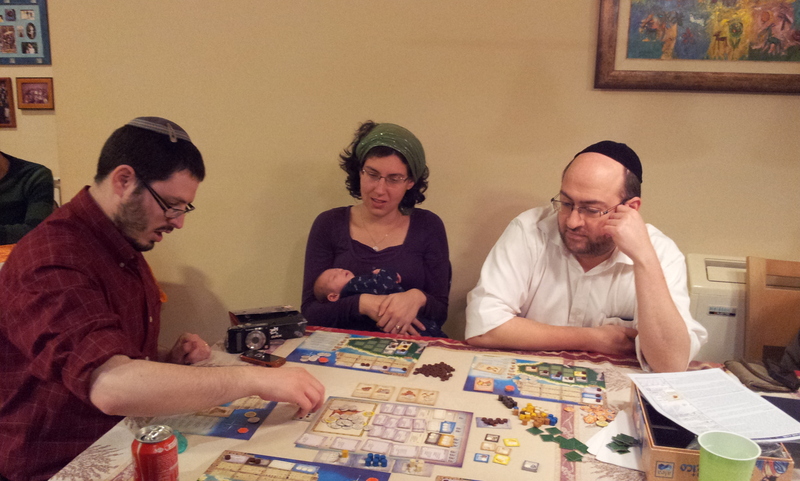 Binyamin taught this to Roman while we played Take It To The Limit; Francis came and watched. I think Binyamin won as the Detective. Nadine writes: My strategy was to stay far behind so people would give me things when required. Which worked. I was the only one below 100. We played wrong – we didn’t replace buildings when taken. Roman had strong intrigues. 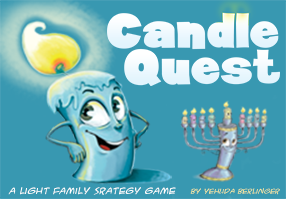 Binyamin requested this because he was considering buying the new version of the game. First play for him and Francis, second for Aaron. As usual, I told the to gang up on me, but there was not much need to. While Francis slowly took control of the New World, it seemed like Aaron was winning with his income and other strong appearance. He also seemed to get a lot of specialists, but then so did Francis. I didn’t feel like I was doing too badly, especially when I had a good income and points in buildings. 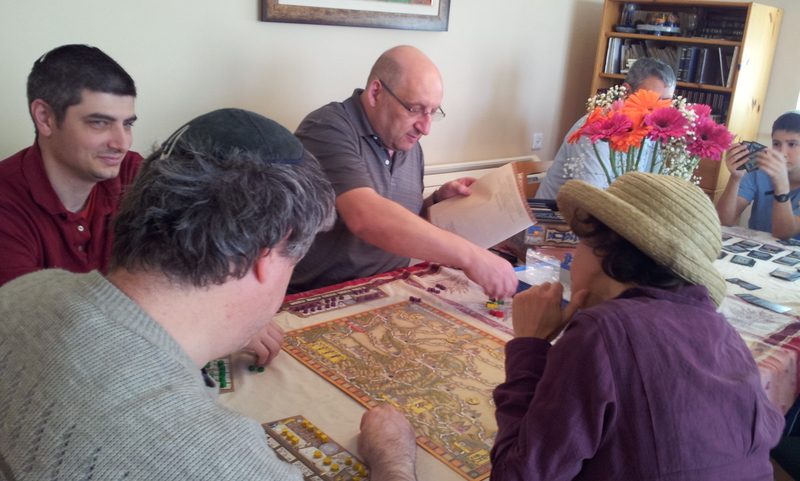 But I lacked points in the New World, and Binyamin and Aaron had better incomes. As usual, not too much in the way of warfare; I rarely say this, but there could be a tad more warfare in the game to make it more interesting. It was a long game, but everyone liked it. I’m writing this late, so I may have crossed my names. I also can’t remember the lovely woman who spoke only Ukrainian and a bit of English. Shneur? Karina is Roman’s girlfriend who spoke mostly Russian. Francis is a volunteer from Kenya who works nearby. 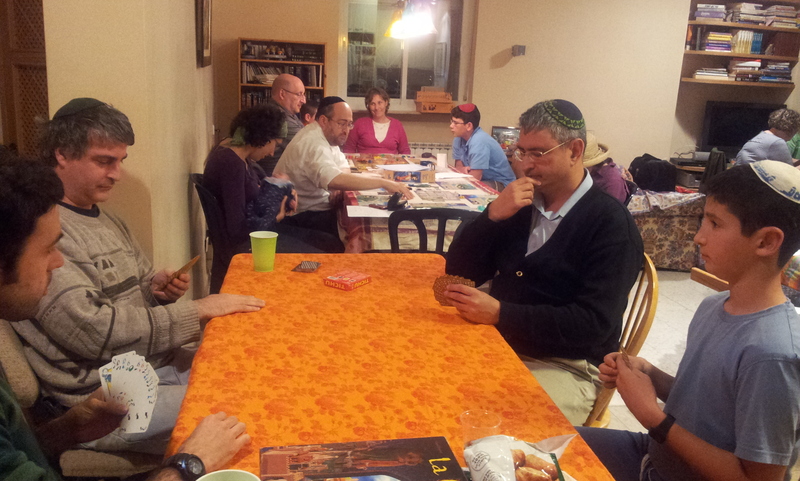 I had him over for shabbat meal and found out that he likes games. This was his first visit. First play for all but me, and I believe Aaron. I started with the board that gives a free science symbol at second level, but could only pick up 3 science cards during the game (without sacrificing too much). My RHO Jonathan produced almost no resources, so I had to build my own. I was also shy in money until the end. I ended with 19 blue points a small amount of everything else except for purple. 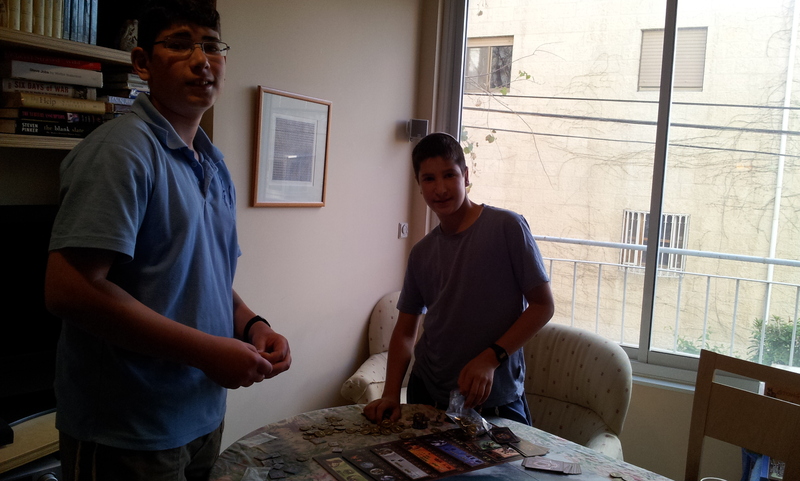 Shneur had the most science (18) but no blue. Alan had the most blue (22) and was the only one with a full monument. Ka has strong purple and science, but -4 in military and not much else. Roman had 15 in military, 10 coins (with very strong resources), and a fair amount in blue and purple. First game for all but me. Karina won. I lost an important discovery with 5 colonists (it required 6) and then lost another one with 4 colonists (it required 4). Luckily, even though I thought I also lost out on my chance to buy two buildings in the last round by the single coin I should have gotten from either of those discoveries, it turns out that I had enough after all. Instead, I couldn’t buy two buildings in the last round because Aaron purposely blocked me from doing so, even though he couldn’t buy one himself. He thought he was blocking Shneur, but in fact screwed me instead. Aaron got the initial $20 building followed by two more buildings, and he was the only one with real soldiers in the New World, but he never had more than 3 income the entire game. Shneur picked up two early merchant ships – even when he couldn’t use the second one – and then a third, and then the building that made each of us pay him $1 per ship per round. By the last round he had 5 merchant ships. We all thought he was going to win, but Karina was massively into missionaries and had such a huge lead in colonists in the New World that she kept ahead in the end. Our game took a VERY long time. I didn’t see how this went, but they played with the real rules about curses that I won’t play with. Still, they seemed to enjoy it. 23 attendees, more than had RSVP’d, but we had enough chairs. And managed to find a kosher for Pesach burger place that delivered. David taught this, new for the others, and David’s already good at it. We had Dark Ages, but they played the basic game. The Ra’anana clique was joined by Shalom. Jon writes: This was the second play for Ellis, Laurie, and me. 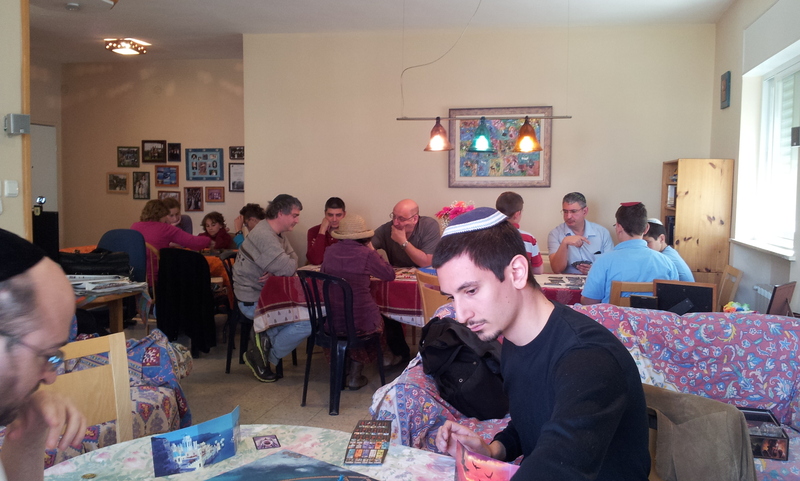 Shalom had apparently played a dozen times. 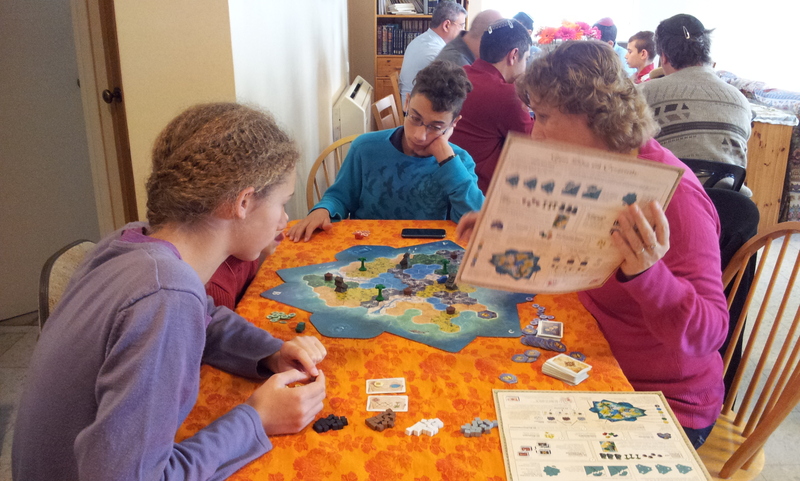 The last time that Ellis and I played, we liked everything about the game except one strategy element that appeared to dominate: taking the extra actions track. I looked online, and many other people also complained about this track, while others said that only the first extra action is really required; the rest can be ignored by getting to the scarce victory point rewards early and/or ending the game before the other players can use their extra actions effectively. After this game, I believe the first argument, but I’m unconvinced regarding the second argument. Part of the game’s strategy, which we are still not effectively using, is to be annoying and to thwart what the other players are doing. Someone with extra actions should be able to effectively shut down someone without extra actions if they do so patiently and consistently. We mostly play by keeping to ourselves, so this doesn’t come into effect. In our game, I went for the first extra action only and then for the bonus victory point rewards that looked to be the most profitable: the bonus disks (that paid for themselves in terms of actions or removing other people’s pieces) and the reward spaces in the lower left corner. I got three of the spaces for 25 points, which was huge in terms of victory points, as you can see from the final score. I got another 15 from the bonus disks. The rest I picked up from two completed tracks on my board (both required to take the reward spaces), taking control of the bonus action space (rather than taking the bonus action, which netted me a point every time anyone else took a bonus action) – I got 5 points from that before someone else took control from me, and the usual assortment of controlled cities. The other players all seemed to be fussing around with controlling various cities on the board or progressing in other tracks. I don’t know if these are worthwhile strategies, but even by early to mid-game I could see that they weren’t going to hold a candle to my strategy unless someone else acted forcefully to block me. No one did. Cliff asked what happens when you run out of Amulets, Jon responded that it hadn’t happened before. Yosef taught this game to me and Hershel. He didn’t explain everything in advance which is fine, but he also didn’t explain strategy much. Hershel didn’t realize that the soldier option was rotating away after one turn, and neither of us realized how important the soldier action was to setting yourself up for the rest of the game. I did tell Hershel that he should at least bid for it to make Yosef pay more, but he wanted a different selection. Yosef was getting 8 coins per round, Hershel was at 2, then managed to get to 3, and I went from 2 to 3. When I decided to play, Yosef said it would take around an hour, but it was taking much longer than that, it ended up 2 or 3 hours. Mishie took over for me and did a great job learning the game while playing. He says he would have won if he hadn’t lost one city at the very end. The game has interesting mechanics, but I don’t like the direct conflict. 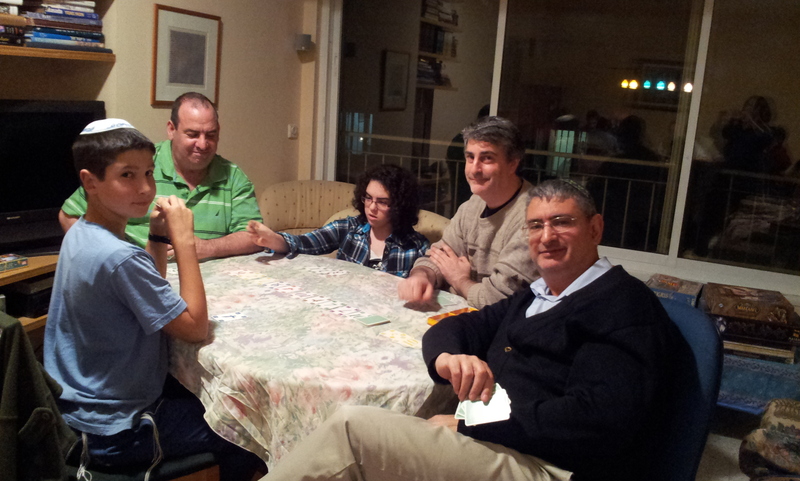 Avi and Yehuda played afterwards. I switched over to teaching Walnut Grove, which everyone liked. It’s quick once you understand the game. 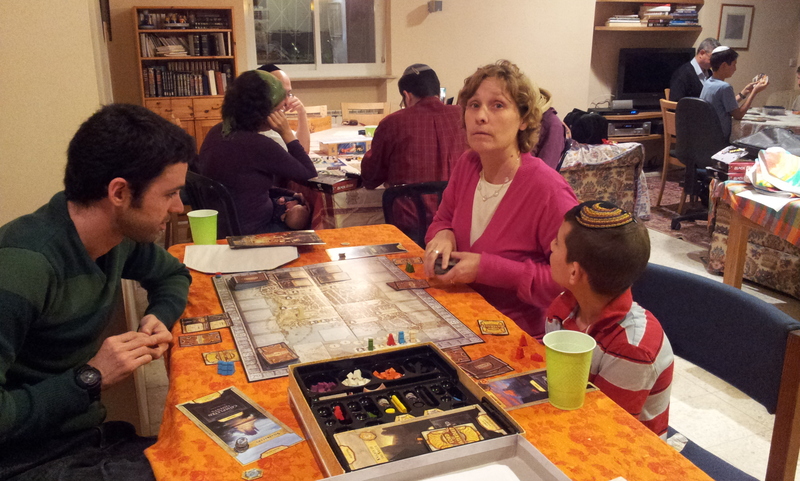 Shalom was doing very well the whole time, fewer mistakes than the rest of us. First game I’ve played where people took negatives, I did too, but we paid them off. And we were playing correctly which is related. On the last round, both Shalom and I sold 3 cubes as our best bet to get more points than buying a farmer. I got 3 points, Shalom 2. So the random draw from the bag of coins could have easily changed the outcome of the game. Shalom had a huge area and the bonus building for it. Laurie had an extra barn, Elijah had a lot of gold coins. Jon and David snuck off for their usual bout. 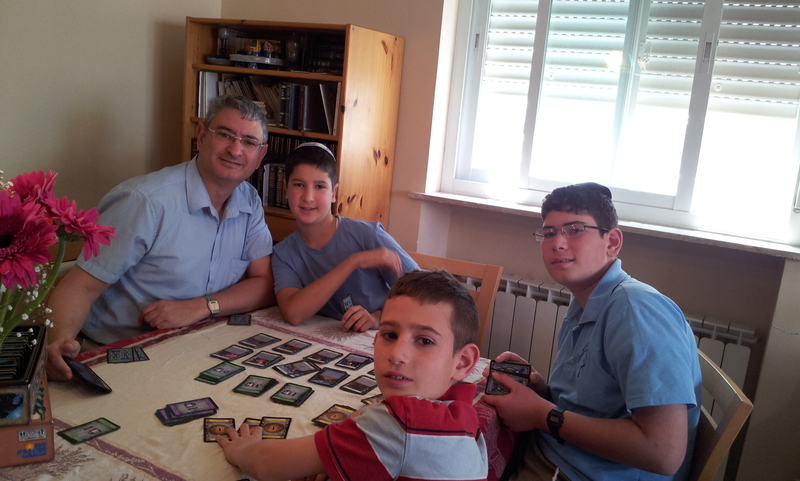 Later, Avi and Yehuda also played with them. From Jon: David and I have seen each other very infrequently, and we love this game. It’s a ritual. David usually wins the “best 2 out of 3” match. David and I drafted from my cards. I didn’t think I was drafting particularly well, since I was giving up some very good card drawing cards to David, and then I ended up playing in a color I hadn’t even been drafting. I played Green with a lot of white and red support. The deck managed to come together pretty well. Even though I only put in 15 lands (7 green, 4 white, 4 red), I had a few cards that boosted mana, fetched lands, or washed colors. This allowed me to actually get out my heavy green creatures. My only concern was to counter what I knew David would be playing: blue fliers. I had just enough utility cards or creatures with reach to handle him. He won the first game (I conceded on my turn when he had 6 points and I had 1, and I had no way to stop all of his creatures on his upcoming turn) and I won the second. We set the cards aside until the evening. I won the tiebreaker game much the same as I won the second game. First play for everyone except Jon. My impression while playing a different game was that David would have won except for a whole bunch of mistakes and misunderstandings. David turned out to be correct in his interpretation of the Stable card – thanks to Hershel who found the information in the rules after we failed online. From Jon: Actually, while we found others online who supported David’s interpretation of the Stables card, we then found that the official ruling (from the designer) was against David. We ended up letting David switch for a different building instead, without disrupting the rest of the game. David played against the odds in drawing cards twice and succeeded both times. He lost because, even with his good luck, he still couldn’t afford the building he wanted when he wanted it. This was due to inexperience in managing his money, I think. He still came VERY close to winning, much better than we were all expecting him to; he gained a whole lot of points from colonies in the new world. I took an obvious early lead by securing good money for buildings and then I was second place in many areas in the new world. Hershel had already surpassed my income level by mid-game, and we all thought he was doing much better than he ended up doing. I think he had almost no discoveries. Michie was the first to start wars, of course, but they don’t do very much in this game. First play for Ellis and Shalom, Gili hadn’t played in a while. Which explains why they played wrong, Gili says probably to her benefit, she might not have won otherwise. I taught this, no one else had played. Yosef watched the French explanation on the Tric Trac site. Elijah misunderstood and gave himself and Yosef 6 extra feet during setup, but fortunately we noticed at the end of the round, and Elijah took back most of his actions; Yosef hadn’t used the extra feet so just returned them. Elijah did a good job balancing round and end game points, and he had 6 points in spear multipliers. Yosef won a lot of round points for the highest number. Laurie balanced well but it wasn’t enough of a total. This was the first time I didn’t reach the Tiki with a village, I wasted 14 points. I don’t think I would have won anyway. I had a -4 but didn’t reach the minimum everytime. I didn’t do a good job calculating which resources to use, my only extra resources were a lot of fruit, and I got all the multipliers. The boat multiplier wasn’t available. When Yosef asked if there was a shul nearby for mincha, someone figured out that we had our own minyan. Good timing on Avi’s bar mitzvah last week! Gili taught this and won. She says they didn’t follow her advice to buy cards. Jon: I taught this and it was generally enjoyed. Jon: Then I taught this to Avi and Yehuda and they loved it. We played twice, and then a third time with David and Laurie joining us. 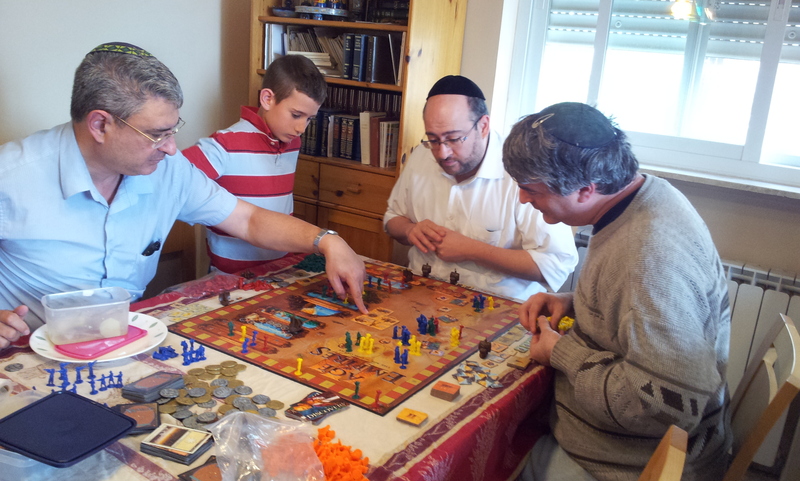 Funny: I also recently taught both of these games to a group in Raanana, who liked No Thanks, but loved Parade. Here it was the reverse. We let Jon and David team up, and came close to beating them. Though we didn’t play a full game, but based on their record, we did really well. Jon: In the second set, I played with Avi and David played with Yonatan. The hands we had all day, until the very end, were fairly lackluster, with few Tichus called and no double victories. Avi and I kept winning hands by a few points here and there. Eventually Yonatan tried and lost a Tichu, David won a Tichu but lost the points for the hand anyway (105 to 95), and I made a Tichu very luckily. I had a 2, 5, and A left in my hand but I wasn’t on lead. I thought I had goofed up. Yonatan helpfully played a 4 and I played my 5, which I thought was finally just what I needed. It came around to me and I played my A, but David played a straight flush bomb over it, leaving me with only the 2. Then Avi (my partner) got in and played the Dog, so I was able to finish. On the last hand, we were at 820 points. Avi called and made Tichu and I went out second. 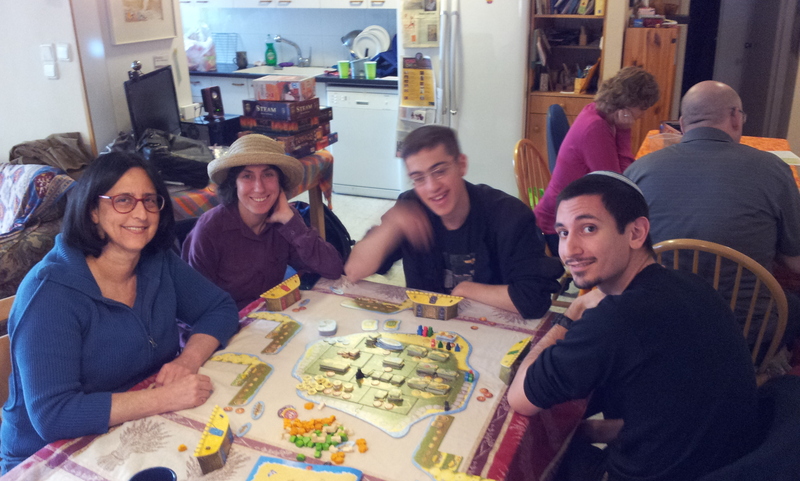 A close and lively 5-player game, Laurie and Eitan didn’t remember the game from having played once a long time ago. We didn’t know who was winning, for good reason. I only had 3 different goods, with factory and wharf, one of each and two corns later. Hershel had factory and harbor. Laurie had a coffee monopoly most of the game, and Eitan had a tobacco monopoly the whole game. Hershel didn’t like the way I taught or gave advice, but I stop giving advice after two rounds except for extreme cases. But then he kept giving advice because they were making bad moves, and kept having me confirm that I would have made the same ‘obvious best move’ as him. We disagreed on building recommendations. Hershel gave Laurie an early coffee trade; but it was wasted when she didn’t buy a factory or harbor or wharf on Hershel’s recommendation, he later got a factory, and I got one. He’s right that it depends, but she would have done better with a good intermediate building. At the end of the game we let Laurie re-mayor because she had bought a warehouse and forgot to mayor it, that happened earlier also with her wharf. People do learn better when they don’t get to take back, but when you play infrequently, it’s harder to play that way. Hershel hadn’t played 5-player before, and didn’t realize that you lose factory income if goods run out. He says at their house they don’t allow discussion because they argue trying to influence moves. Emily had a large market but no trade good. Eitan did well with his tobacco monopoly, though he shipped his indigo instead of taking an available empty ship. Hershel mayored a lot for fortress, which ended the game suddenly when he was last player. We each had one big building. Abandoned because they were playing wrong. Jon: Abandoned not only because they were playing wrong (only transporting once per round instead of twice), but because everyone was really interested in playing other games instead. Uli – our youngest and most well-behaved gamer. Emily for playing, taking care of Uli, and organizing the dinner order all at the same time. 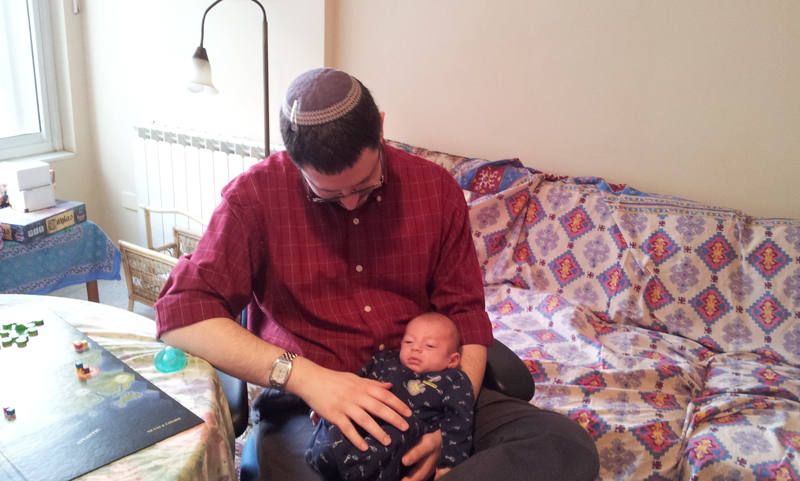 Eitan for letting Emily have Uli so he could make up the minyan. Mishie for playing like a grown-up. Cliff for giving up playing for a last minute guiding job. Ellis and Laurie for schlepping from Ra’anana. Yosef for putting up with our English. Avi and Yehuda for attending right after Avi’s bar mitzvah. Hershel for being able to play sub-optimally. Elijah for taking time to attend. Shalom for continuously explaining Walnut Grove when he had just learned it. Gili for teaching the most games. David and Jon for winning Tichu by only 5 points. Thank you to everyone who brought snacks, especially chocolate!